The latest crash test results in the #SaferCarsForAfrica campaign, released by Global NCAP and AA South Africa earlier this month, revealed that Nissan's NP300 "Hardbody" received a zero-star safety rating. According to the Global NCAP: "The vehicle structure collapsed and was found to be unstable during the test. The high forces placed on the crash test driver dummy pose a significant risk of fatal injury. The NP300's bodyshell was so unstable that the airbags were ineffective." Global NCAP Secretary General, David Ward, and AA South Africa CEO, Collins Khumalo, have now written to the UN Economic Commission for Africa and the African Development Bank, calling for urgent action by African governments to, says the organisations, "prevent the sale of zero star cars such as the Nissan NP300". Compliance with the NCAP standard is voluntary in SA and the organisation first began testing cars sold in for crashworthiness in 2017. "Indeed, Nissan misleadingly claims that the car occupants are protected by a so-called 'Safety Shield' and its 'Hardbody' label also conveys an image of strength. However, in our crash test, the car's bodyshell collapsed and neither the steering column nor the airbags acted as they should to minimise risk of injury," Ward added. "In our view remedial action to strengthen the NP300's bodyshell is now urgently needed. This is a concern not just in South Africa but elsewhere as Nissan has plans to increase exports of this vehicle across Africa. "We believe action should be taken now to prevent the sale of zero star cars like the Nissan NP300 anywhere in Africa," he concluded. "These results are outrageous and show unsafe vehicles are being sold to the people of Africa, which no manufacturer would consider selling in other markets," said Collins Khumalo, CEO of the AA of South Africa. He said: "Aiming to meet or exceed minimum standards is not the same as making vehicles with acceptable safety standards, and manufacturers know this. These standards must change, and we need urgent intervention from policy makers to make this happen." Wheels24 reached out to Nissan South Africa for comment. Nissan SA said: "The safety of our customers is Nissan's top priority. All of our cars meet or exceed regulations in all countries in which they are sold. "The Nissan NP300 is a tried and trusted partner for businesses and entrepreneurs, providing reliability and affordability. "Continuous improvements are being made to the NP300 such as dual airbags and ABS brakes which are fitted as standard equipment. Nissan is studying further enhancements." 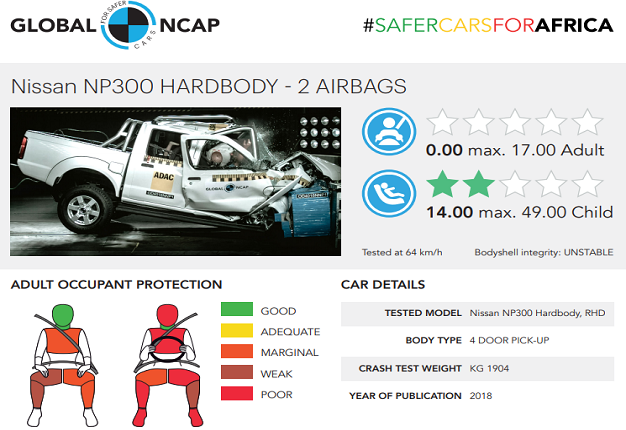 The NP300 "Hardbody" achieved an alarming zero star rating for its poor adult occupant protection mainly in the driver head and chest areas in the frontal crash test at 64km/h. 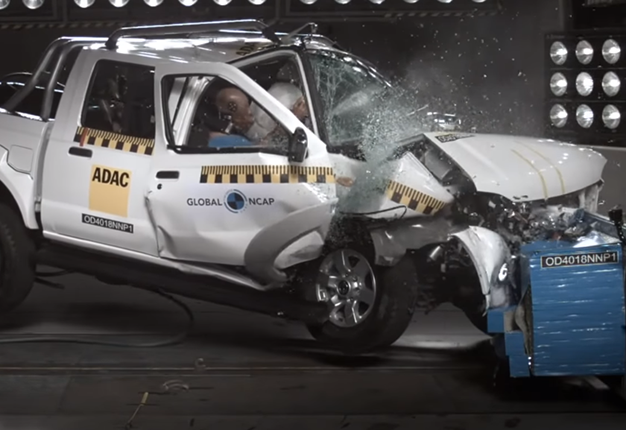 According to Global NCAP: "The vehicle structure collapsed during the crash test and it was rated as unstable. The steering wheel column did not collapse penetrating the passenger compartment, creating an additional risk for the driver as it moved straight into the dummy chest. This performance showed a significant risk of injuries for the driver despite the car being equipped with double frontal airbags." "The high probability of life-threatening injuries to the driver's head and chest resulted in the zero star adult occupant protection rating. Even with an airbag the driver's head and chest showed high biomechanical readings." The NP300 "Hardbody" achieved two stars for child occupant protection, the low result is mainly explained by the decision of the car manufacturer to install one of the child seats without following child seat manufacturer clear instructions. The National Automobile Association of South Africa said: "It is NAAMSA's considered view that the improvement of road safety worldwide and in South Africa requires an integrated approach focussing on a combination of factors and stakeholders. Factors include road infrastructure, road safety management, road user training, education and driver behaviour, road traffic rules and their enforcement, efficient medical care in the event of accidents, effective analysis of road accident causes and their consequences, vehicle age and composition, vehicle design among others. "Isolating one of these factors, while neglecting the others, will not yield hoped for benefits. Road and vehicle safety requires an integrated approach involving all stakeholders. "Importantly, in South Africa, focussing only on new vehicle design specifications ignores the need to accelerate the renewal of vehicle fleets. It also disregards the very specific local conditions relating to our road and repair infrastructure, road user behaviour and traffic composition. "All parameters involved in road safety should be addressed holistically. The global motor industry accepts responsibility for vehicle design and safety performance. However, NCAP is a voluntary initiative and ultimately it is up to individual vehicle manufacturers to decide whether they wish to participate in the 'Safer Choice Africa' award."